The newly opened Texas Museum of Science & Technology (TXMOST) recently had its grand opening exhibition this featuring the Central Texas premier of BODY WORLDS, the sensational anatomical exhibition series. The world-renowned scientific exhibition features stunning anatomical figures in lifelike poses, preserved in immaculate condition by innovative plastination. Cool doesn’t even begin to describe it all. The opening of TXMOST is a momentous occasion for Central Texas; despite its national reputation as a center of science research and technology, Austin has been the largest metropolitan area in the country without a multidisciplinary science museum or planetarium. Now, thanks to TXMOST, kids and families in the Austin area will have access to both. 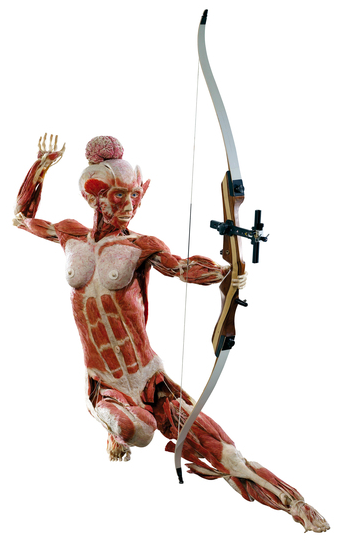 More than 100 specimens, visitors to BODY WORLDS & The Cycle of Life will see individual organs and systems, as well as full-body plastinates in various action poses, including flamenco dancers, a baseball player, acrobats, ice hockey players, and more. “A Heartbreaking Work of Staggering Genius,” a stunning look at conception and prenatal development. This area features a multimedia display on cell division and a remarkable collection of plastinated embryos and fetuses acquired from historical anatomical collections. The Artists' Gaze, an exploration of the sight and visions of artists Claude Monet and Edgar Degas, who suffered from cataracts and retinal eye disease. Centennial Village, a feature on the findings on geographic clusters around the world where the longest living people live—from Okinawa, Japan and Ovodda in Sardinia to the Hunza region of Pakistan.